Half of new teachers in urban school districts leave within the first three years, reports the advocacy group Urban Teacher Residency United. Much can be learned by understanding what pushes professionals out of urban classrooms. But what about the other half -- the 50 percent who stay? Why do they remain in beleaguered urban school districts such as Detroit's? Maybe it’s because they see their work as a passion, not a paycheck, like former truck driver Dwayne Triplett. Or maybe they see teaching as a way to give back to their community like Gerlma Johnson, a 20-year veteran of the Detroit Public Schools. Seventeen years ago, Dwayne Triplett was driving a truck when his brakes suddenly failed on Interstate 94. The resulting accident sent him to the hospital with neck, brain and back injuries. It was then that the single father of two felt a “calling” to become a teacher. 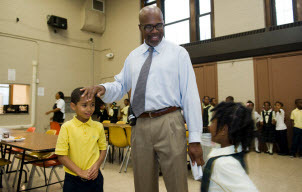 Even as the district threatens to lay off more than 750 employees next year, Triplett now helps haul knowledge to young minds as the assistant principal at Bethune Academy Elementary/Middle School in northwest Detroit. Despite all the negative publicity, despite all the challenges in the classrooms, despite the, frankly, poor student outcomes across the city, Triplett is more determined than ever to serve the children of Detroit. For Johnson, teaching is intensely personal. She attended school in the very same neighborhood where she now serves as principal of Amelia Earhart Elementary/Middle School. In her position, she has the chance to be a part of a change in her students’ lives. “I always wanted to be someone who could make a difference, and I could see the difference that I’m making,” Johnson explained. Triplett gets to make that difference by working one-on-one with his students. His professional dress is just one of the ways Triplett aims to set an example at the academy, which has implemented a strict uniform code for its students. This student, according to Triplett, came to school angry and always wanting to fight. He sat in the back of the classroom and struggled academically. Triplett would relay stories about himself and his own personal struggles, both academically and personally, to this youth. He gave the student leadership roles in the school, helped him understand concepts of math in a way he could relate to, would work with him on his days off and basically showed that he cared. After two years, Triplett said, the student’s attitude has been transformed. The student is now doing well. He is in vocational training to become a tool-and-die operator. Triplett gets a call from the student every Fathers Day and even on his birthday. If the student needs to talk, Triplett is there to listen. As a principal, Johnson looks at how she can affect the life of every child in her school. That difference is achieved, she said, through a variety of efforts, such as setting high standards in the classroom and placing an emphasis on best teaching practices. Johnson also realizes that many of the children and their families face challenges outside of the classroom that may affect learning. In order to better meet the needs of the students, DPS provides a wide range of services, such as free meals, and hearing and vision assistance. In addition to those services, Johnson, who also enjoys mentoring students in her spare time, has implemented a variety of programs aimed specifically at Earhart. To better engage with a 90 percent Latino student body, for example, all teachers at the school are committed to learning Spanish. And to engage a healthy mind and body, the school has implemented a sports program that offers not only the traditional football and basketball, but also soccer and track and field. The results of these services, Johnson explained, are tangible. “I have seen young ladies take more pride in their appearance, they are more circumspect in their behavior, especially with their interactions with young boys and they are able to verbalize what they want to do with school and career path," she said. "I’ve seen an increase in attendance. I’ve seen an increase in their attitude toward school. I see that the children see that the school is a safe, welcoming and nurturing place of education and so do the parents," she added. Teachers are among those often thought to be overworked and underpaid. Despite this, Triplett and Johnson stay because it’s their calling and mission to reach children in the Detroit Public Schools. “My goal in life is to be where god places me, and I feel that I am needed here, I feel that I am wanted here, I feel that I can make a difference. So I’m going to do the best job that I can possibly do to make sure that these children get the best possible education,” Johnson said. These two teachers are representative of the truly dedicated and wonderful teachers of Detroit. How many people know that there are teachers in Detroit that are dealing with more than 50 children in elementary classrooms that do not have enough desks and materials? Children are being denied classes in the arts, technology and physical education because no teachers are available for those positions. Teachers are giving up their preparation time to cover for other teachers' classrooms so that teachers that are ill can go home. Teachers are giving up their lunch times to provide coverage in the cafeterias because there are no lunchroom aids. There are islands of normalcy within the schools, but in many places children and their teachers are being faced with incredibly difficult situations. Here is a link to an education blog that shares the angst of a Detroit teacher, written by Nancy Flanagan, a Michigan Teacher of the Year. http://blogs.edweek.org/teachers/teacher_in_a_strange_land/2011/09/dispa... I wonder where is the outrage? Mr. Robert's hosted Arne Duncan, Secretary of Education. He was not shown this picture of Detroit Schools.